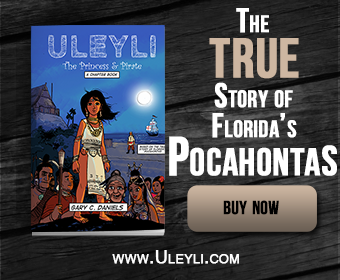 Spanish eyewitness accounts of the tactics used by Indian tribes when attacking their outpost of St. Augustine give a fascinating new view of Native American life at the time of first contact. The typical view is that Native Americans were outmatched by the European’s superior weapons and tactics but these eyewitness accounts contradict these views. 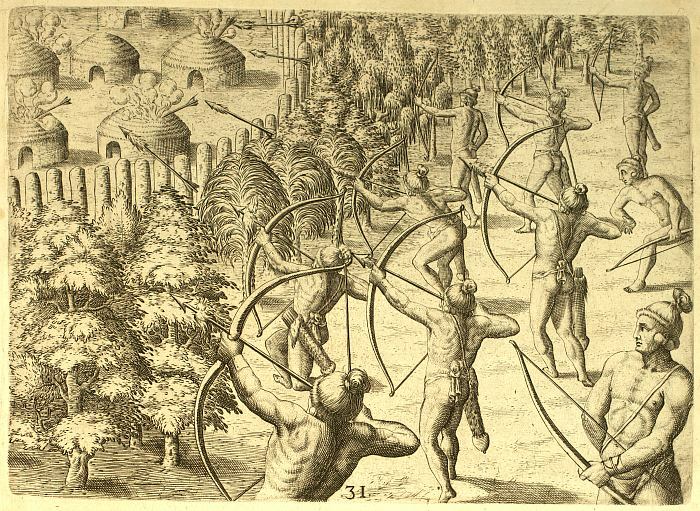 It appears from these accounts that the Natives had the superior tactics and their “primitive” weapons, i.e., bows and arrows, were both faster to fire and more accurate than the Europeans’ more “advanced” weaponry. Check out this eyewitness account below of the successful Native attacks against the first Spanish colony in America at St. Augustine. The illustrations accompanying this article are from the French artist Le Moyne, the first artist to depict the lifeways of Native Americans. All the neighboring Indians were on the warpath and made raids against the two forts, doing whatever damage they could. At St. Augustine they had twice shot arrows into the sentries on guard during the night, and had succeeded in killing two soldiers. They fired the powder magazine, which readily caught fire because it was thatched with palmetto leaves. Fire arrows were showered on the houses at night whenever a breeze was blowing. The sparks caught and nothing could stop them. The powder ignited and flames engulfed cloth, linen, stores, and the flags and standards, both those belonging to the Adelantado and those won by him from the Lutherans. So thoroughgoing was the Indian incendiarism that nothing could be salvaged. How the Indians used fire arrows to set the thatched roofs of their enemies ablaze. The natives conducted their warfare this wise: small groups lay in ambush to shower arrows on any stray Spaniard looking for palmetto shoots or shellfish. So adept were they at this practice that they could dart in and out among the Spanish force without endangering themselves; for in truth, these Florida natives were more swift and lithe than any Spaniard. They are so sure of not being caught that they venture very close to the Christians before discharging their arrows. These arrows are loosed with such force that they pierce any clothing as well as coats of mail. So quick are the Indians in releasing the arrows that they can wait for a harquebus to be discharged at them, when the Spaniards use these weapons, and then release four or five arrows in the interval during which the soldier reloads his piece. As soon as the Spaniard pours in the powder to prime his piece, the Indian hides among the grass and woods, for the terrain is very luxuriant and covered with forests and underbrush. By the time the powder is ignited in the harquebus the native has crouched and is crawling through the grass and undergrowth. When the soldier has fired, the Indian rises at a place different from the spot aimed at, as if he had been swimming underwater. So adept and clever at this maneuver are they, that one can only be astonished. They fight by skirmishing, and jump over the brush like deer. 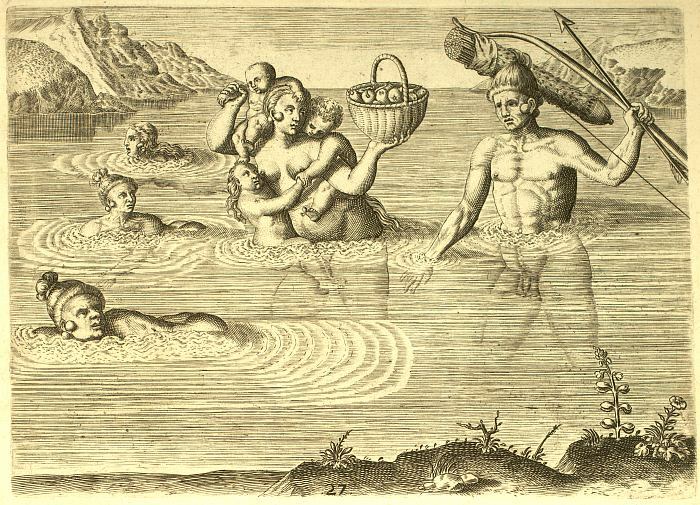 Any Christian would be worn out pursuing them, for they travel unencumbered by clothes, and swim like fish, so that when they reach a river they swim across, holding their bows and arrows above their heads to avoid getting them wet. Once on the opposite bank they shriek and mock the Christians. When the Spaniards retreat, the Indians return in pursuit and, emerging from amidst the thickets, again loose their arrows upon the Christians. They lose no opportunity for making use of this maneuver, so that to wage war upon them is a bad risk. The only way to make them keep their agreements– and they are great liars and traitors– is to rout them out of their villages, burn their dwellings, cut down their plantings, seize their canoes, and destroy their fishways. Then they realize they must do the Christians’ bidding, or abandon the land. The natives at St. Augustine and at San Mateo are very treacherous and deceitful, especially since they feign friendship with the Christians for their own immediate ends. If they are not given food, clothing, iron axes, and other presents when they come to the forts, they leave in a great rage, go on the warpath, and kill any Christian they encounter. Thus it has come about that despite ostensibly peaceful relations they have killed more than one hundred soldiers.